Edith is an American Tribal Style® belly dancer, a style created by Carolena Nericchio, the founder and director of Fat Chance Belly Dance® in San Francisco. ATS® is a fusion of many different dances of the world, including classical Indian, Spanish Flamenco, Middle Eastern, and North African. It is characterized by women dancing together, improvising spontaneously, and communicating through their movement vocabulary. Choreographies are also created around the logic of formations and cues for stage. Edith enjoys creating in the moment to see what manifests and hopes to share the joy of dancing with others. She dances with the Barefoot Truth Dance Company, founded by Nova Dawn and co-directed by Whitley Nabintu Marshall, based in Southern Maine. Edith holds a B.A. in Psychology from the University of New Brunswick. She completed Yoga New Hampshire’s 200 hour Yoga Teacher Training in 2016, and Teacher Training with Carolena Nericchio in Orlando, Florida in 2017. 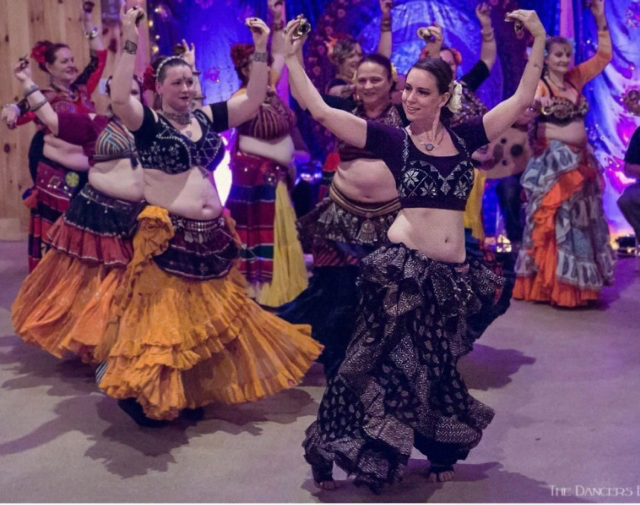 She is a Sister Studio of Fat Chance Belly Dance® based in the Seacoast area of Southern New Hampshire/Maine.